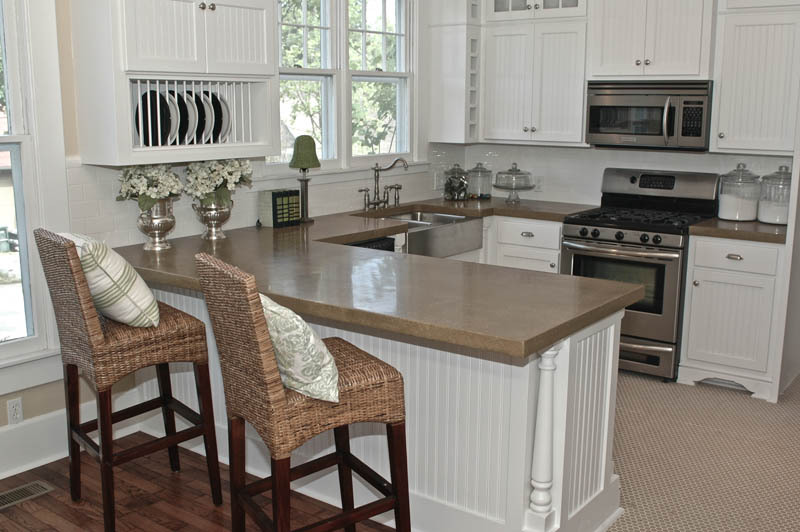 "We are so delighted with our countertops from Concrete Creations. Of all the subcontractors that worked on our new home, Lucas from Concrete Creations was absolutely the BEST! His craftsmanship is superb---far, far better than any other concrete countertops you will ever see. And, if the final product wasn't amazing enough, his service and professionalism were beyond great. Lucas worked many long hours to meet our deadline; he kept us informed; and the installation went perfectly. We are happily recommending him to all of our friends!" "In November 2005, Concrete Creations installed our countertops in our new house. We had an urgent deadline, we were hosting our daughter's bridal shower on December the 4th. Not only did he deliver right on time, but we were so delighted with the tops. The finish was excellent, and the workmanship was outstanding. It was even better than we expected. It was remarkable after more than a year of building a house and being bone weary with building fatigue. Now, after more than eight years of living with concrete countertops, we have never regretted the choice. Living with these tops has been so easy. We have a busy kitchen, and do a lot of entertaining. The concrete countertops have done very well through the years. We have a wood burning pizza oven and being able to roll the dough on the top is an extra bonus. We would choose Concrete Creations again, anytime!" "What an amazing experience, we are so happy now! Our kitchen is absolutely gorgeous! From Lucas’ assistance with the redesign of the kitchen island, to the install, the entire experience has been nothing but pleasant and professional! Lucas’s work is impeccable and the follow-up and customer service is so nice! We look forward to the next phase of our master bath and laundry room in the near future!! I highly recommend this company for your concrete countertop needs! Thank you Lucas and Team at Concrete Creations!!"